Light as air. The Cumulus is encased in cloud-like waterproof nylon and has a spacious main interior. Collapse it for easy travel and snap it shut with magnetic closures. No one wants to spend nearly $200 on a bag they can get for less. So I'm embarrassed to say but yes I purchased a cheap puffy type bag at target and the strap actually fell off within a week. I finally just ordered this bag which is actually the one I really wanted! And I should have just ordered in the first place. I have packed this bag full with laptop, sneakers, my lunch, a huge water bottle and my makeup case and this bag is up for the task. The quality is great and I regret buying the cheap bags I used to buy. This bag is perfect for every day. I use it going to work and holds all my daily necessities i carry in my purse and my breast pump stuff and with room to spare. The compartments are perfect for organization and i love how i know where everything is!! The fabric is so soft, shiny, and luxurious which makes the bag not only practical but extremely trendy and stylish too!! I've returned from my trip and I'm still using my Cumulus Tote. I never saw myself as the bag typed, but the stylishness and functionality are just hard to ignore. Now this is my go-to every day bag of choice. Thanks Caraa for designing such an amazing bag. 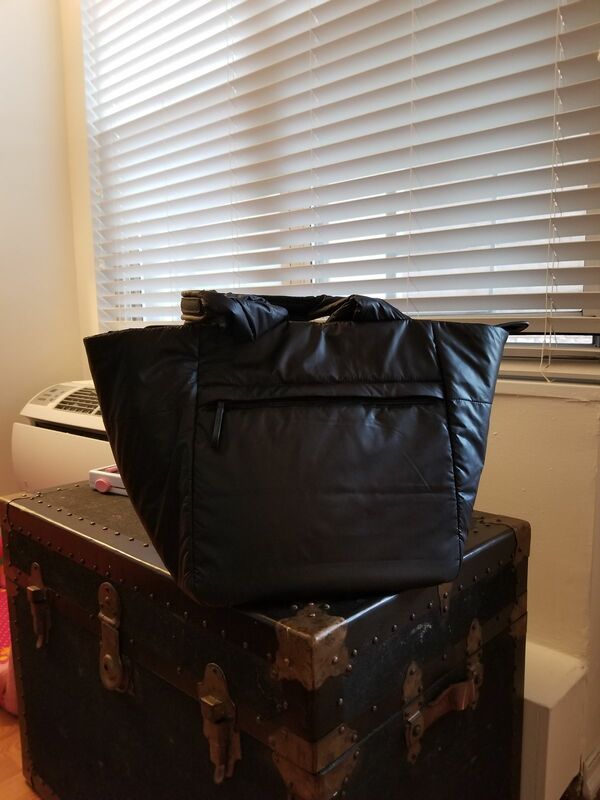 I used this bag as my travel bag for first time last weekend and loved it. I bought mine in the Olive color and it is a gorgeous bag! I have been eyeing the new Vanilla color, probably will be buying that too next.